Our 32 piece orchestra took the stage on the 2/6/18 to a full house on the last night at The Hall For Cornwall for 2 years as they closed for renovations. Our latest album was recorded (more details to follow soon) and a very special guest Carleen Anderson joined us on stage for our classic track Water in The River. One more thing! UK national tour! With so much effort going into one performance, sharing the Orchestral experience outside of this show would seem impossible... until now! The Hall For Cornwall show is being filmed and recorded meaning that with a bit of artistic wizardry, Ben and Zaid can pack the orchestra into a suitcase and will tour the “Virtual Orchestra” in July, August, November and December all over the U.K. 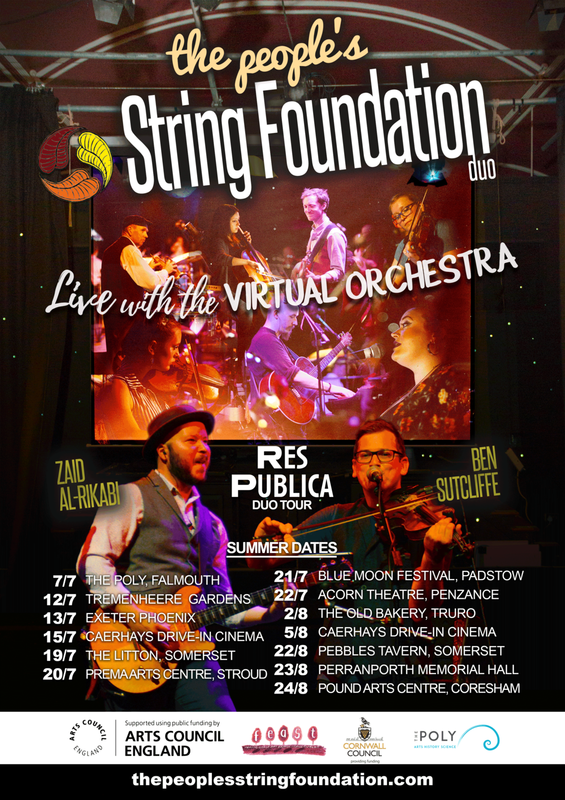 Core members of the Strings Ben, Zaid and Chris tour the UK playing festivals, art spaces, theatres and music venues. This summer we had the great pleasure to compose and perform for a very special theatre event; the collaboration between O-Region's Simon Harvey and the ever magical Kneehigh Theatre. The production opened at the theatre's very own space the Asylum on 06/08/2016 and ended on the 21/08/16. 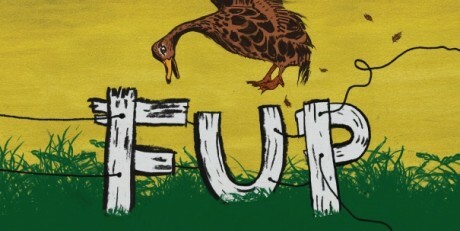 A brilliantly funny and yet piercingly heart breaking adaptation of Jim Dodge's book FUP (a modern American fable), the show transported this story from midwest America and landed it perfectly into a quirky, slightly surreal Cornwall. The show recieved great reviews from Cornish and national papers, The Times gave it a 4/5* and The West Briton 5/5*. The relationship between the "Rogues" and The People's String Foundation is a strong one. Over the years the shows and music have forged an intoxicating mix of energetic, imaginative scenarios and rousing emotive anthems. Voted in The Guardian's top 10 Christmas walks, this year's Winter Wood show returns for another December in the enchanted Tehidy Woods. It is sure to be yet another inspiring collaboration between our two projects. As well as O-Region, Rogue and Kneehigh, we have also had a long working partnership with Dean Nolan. He has produced and acted in several Arts Council funded productions based around Cornwall's dark and vibrant history, and we have always been there to provide him a soundtrack. After a successful season at the Globe in London and a tour with Kneehigh in Steptoe and Son, we look forward to having him compare at our next orchestra show. The latest release is an attempt to raise awareness of the suffering of the refugees in the Calais jungle, and inspire people to donate a minimum of £5 (or more) to Care4Calais. They are a UK based charity, providing much needed support. "RIGHT NOW, AROUND 9000 REFUGESS FROM WAR-TORN AND POLITICALLY UNSTABLE COUNTRIES REMAIN 20 MILES FROM THE COAST OF DOVER, UK. They are subject to appalling conditions with little access to water, food or sanitation. We have experienced great strength and kindness from the migrants in the Calais camps and have been overwhelmed with their tenacity. But no human should be made to live like this and the conditions here are getting worse. Following the evictions the camp is severely overcrowded, our resources are stretched to their limits and we urgently need your help to continue distributing aid. Although governments do not recognise this as a humanitarian crisis, you can." All profits from the EP will be donated each month to Care4Calais.